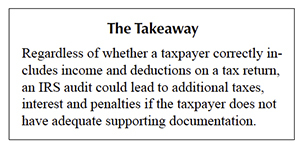 Regardless of whether a taxpayer correctly includes income and deductions on a tax return, an IRS audit could lead to additional taxes, interest and penalties if the taxpayer does not have adequate supporting documentation. In general, the IRS is deemed correct by the courts. Taxpayers have the burden of proof. They must furnish records showing that income and deductions on the return are accurate. Taxpayers frequently lose court cases because of inadequate documentation. Some of these losses are in the real estate area and highlight avoidable record-keeping mistakes. Several recent tax court cases provide examples. In 2014, additional taxes, interest and an "accuracy-related substantial understatement penalty" were imposed on a property owner because of inadequate documentation of hours spent managing the property. Documenting the number of hours was necessary for the owner to show he was a real estate professional, and, therefore, eligible to deduct losses. Ideal documentation would have included "contemporaneous daily time reports, logs or similar documents." If these were not available, acceptable documentation could have included "identification of services performed over the period and the approximate number of hours spent performing such services, based on appointment books, calendars or narrative summaries (see "Part-Time Pitfalls​"). Roughly a year after the tax year in question, the taxpayer created a calendar based on "very cryptic notes" contained in a notebook. The notes were incomplete with regard to the hours spent in connection with the property and lacked any supporting documents. After the IRS audit, a second logbook was created that listed more items such as additional hours, including the time spent on Craigslist ads, emails and travel time to and from the property. The taxpayer was required to pay taxes and interest based on the disallowance of the rental losses he claimed. In addition, he was required to pay an accuracy-related penalty of 20 percent of the tax because he was found to be negligent. "Negligence includes any failure to make a reasonable attempt to comply" with the tax law, such as "failure to keep adequate books and records or to substantiate items." In a 2014 tax court case, various deductions claimed by a real estate salesperson were denied because of a lack of documentation. The disallowed deductions pertained to depreciation, insurance, mortgage interest and homeowner association dues for three properties. One requirement for depreciation is that the property has been "placed in service" during the year — that is, advertised for rental or actually rented. The IRS claimed that two of the properties were apparently under construction during the tax year and, thus, were not yet eligible for depreciation. The salesperson had no proof that the properties were placed in service during the tax year. Deductions associated with the third property were disallowed because the salesperson could not demonstrate that he owned or had any legal interest in the property. 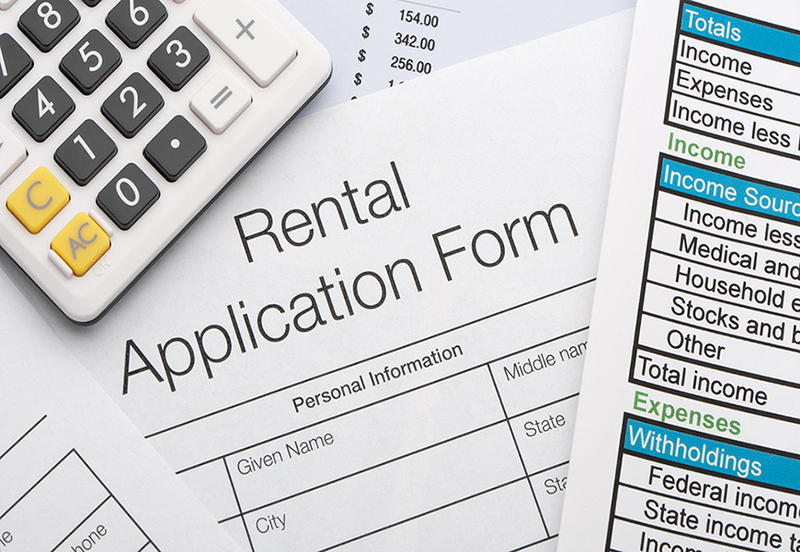 In 2013, a real estate salesperson lost deductions for rental expenses associated with a duplex. The property was co-owned with his cousin. 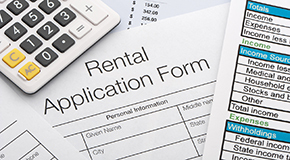 No rental income was reported for the year in question, and it could not be proved that the property was advertised or available for rent. The salesperson was unable to provide supporting evidence showing how expenses were allocated between the duplex units. Also, there was insufficient evidence with regard to the actual cost of the building (separate from the land). The salesperson's "educated guess" was disregarded by the IRS and the court. Furthermore, the salesperson allocated all of the depreciation deduction to himself, rather than splitting it 50/50 with his cousin. A 2015 tax court case provides additional examples of poor documentation. While the case pertains to a real estate appraiser, similar documentation issues arose. The items questioned by the IRS included depreciation, interest, repairs, supplies, taxes, legal and professional fees, travel, utilities expenses and operating losses. To avoid the problems illustrated here, obtain advice from a tax accountant or attorney knowledgeable in real estate matters before real estate activities begin. Salespersons should consider recommending such advice to their clients.